Ran when parked. Decoding Craigslist Motorcycle Post B.S. For years, hours upon hours have been poured into trolling craigslist ads. We search relentlessly in hopes of discovering that perfect bike that satisfies our passion and doesn't deplete our bank accounts. But there is a secret language that craigslist ads utilize that could be more deceiving than you'd originally thought. 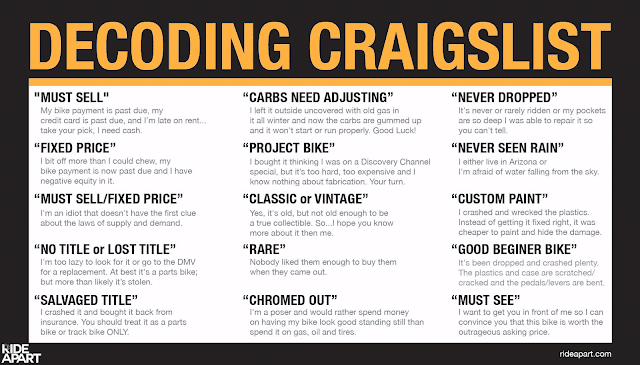 We set the record straight by decoding craigslist. Here are some key words that all of us have come across only to find the owner stay as vague as possible in their descriptions. My bike payment is past due, my credit card is past due, and I’m late on rent...take your pick, I need cash. I bit off more than I could chew, my bike payment is now past due and I have negative equity in it. "Must Sell / Fixed Price"
I'm an idiot that doesn't have the first clue about the laws of supply and demand. "No Title / Lost Title" I'm too lazy to look for it or go to the DMVfor a replacement. At best it's a parts bike; but more than likely it’s stolen. I crashed it and bought it back from insurance. You should treat it as a parts bike or track bike ONLY. I left it outside uncovered with old gas in it all winter and now the carbs are gummed up and it won't start or run properly. Good Luck! I bought it thinking I was on a Discovery Channel special, but it’s too hard, too expensive and I know nothing about fabrication. Your turn. "Classic or Vintage" Yes, it's old, but not old enough to be a true collectible. So...I hope you know more about it then me. Nobody liked them enough to buy them when they came out. I'm a poser and would rather spend money on having my bike look good standing still than spend it on gas, oil and tires. It's never or rarely ridden or my pockets are so deep I was able to repair it so you can't tell. "Never Seen Rain" I either live in Arizona or I'm afraid of water falling from the sky. It's been dropped and crashed plenty. The plastics and case are scratched/ cracked and the pedals/levers are bent. "Must See" I want to get you in front of me so I can convince you that this bike is worth the outrageous asking price.